Less than three years after Bobby Hutcherson made his recording debut, the twenty-three year old vibraphonist released his debut album The Kicker on Blue Note Records in 1963. This was the start of the most prolific period of his long career. Over the next fourteen years, Bobby Hutcherson released fifteen studio albums, one live album, two collaborations with Herbie Hancock and five with Harold Land. Bobby Hutcherson was also the go-to-guy for anyone looking for a vibes player and played on over forty albums during his time at Blue Note Records. These albums featured the great of jazz, and most of them were released on the legendary Blue Note Records. However, by 1977, Bobby Hutcherson’s time at Blue Note Records was at an end. His swan-song was Knucklebean, which had been released in 1977. After releasing twenty-one albums for Blue Note Records, Bobby Hutcherson was heading for pastures new. Next stop for Bobby Hutcherson was Columbia Records, where he released a trio of albums between 1978 and 1980. Bobby Hutcherson’s Columbia Records’ debut was Highway One in 1978, with 1979s Conception: The Gift Of Love and Un Poco Loco following in 1980. These three albums were recently remastered and reissued as a two CD set by BGO Records. This is the first time that Bobby Hutcherson’s Columbia Records’ years have been reissued on CD. It’s the long-awaited opportunity to revisit what was the start of a new chapter in Bobby Hutcherson’s career.…the Columbia Records’ years. By the time that Bobby Hutcherson signed to Columbia Records, jazz’s number one vibes man was thirty-seven, and had been a familiar face on the American jazz scene since he made his recording debut on the West Coast August 1960. Nineteen year old Bobby Hutcherson made his debut with the Les McCann Trio, on the ‘3rd’ of August 1960 when they recorded a single that was released on Pacific Jazz in 1961. Just over four months later, and Bobby Hutcherson joined the Curtis Amy-Frank Butler Sextet when they recorded Groovin’ Blue on December the ‘10th’ 1960. This was the first of many albums that featured Bobby Hutcherson’s vibes. In 1962, Bobby Hutcherson moved to New York, and was living in the Bronx. Although he was determined to make a career as a jazz musicians, he supplemented his income by driving a taxi. Just over a year later, Bobby Hutcherson had released his debut album The Kicker on Blue Note Records in 1963. This was the start of the rise and rise of Bobby Hutcherson. Over the next four years, Bobby Hutcherson divided his time between his solo career and his work as a sideman. By 1967, Bobby Hutcherson was already a stalwart of the New York scene. Then disaster struck for Bobby Hutcherson. This came after Bobby Hutcherson and Joe Chambers were arrested for possession of marijuana in 1967. As a result, the twenty-six year old lost his New York City Cabaret Card and taxi license. For Bobby Hutcherson this was a disaster, as he was no longer able to work on New York City’s cabaret circuit or drive a taxi, which was how Bobby Hutcherson had supplemented his income since the earliest days of his career. That was no longer possible. With his New York City Cabaret Card and taxi license revoked, Bobby Hutcherson decided to go west. Bobby Hutcherson moved to the West Coast in 1967, looking for a new start. While he continued to record for Blue Note Records until 1977, life on the West Coast suited Bobby Hutcherson, and he eventually found a house forty-five miles outside of San Francisco, just off Highway One. This was an idyllic place to live, and would provide the inspiration for Bobby Hutcherson’s first album for Columbia Records, Highway One. When it became known that Bobby Hutcherson was leaving Blue Note Records, Bruce Lundvall made his move and signed the vibes man. This was the second major coup of the past two years. Bruce Lundvall had signed Dexter Gordon in 1976, and his signing was a commercial success. Soon, Bruce Lundvall got the green light to sign more ‘straight ahead’ jazz musician. This included Woody Shaw and in 1978, Bobby Hutcherson. Having signed to Columbia Records, Bobby Hutcherson was keen to begin work on his first album since leaving Blue Note Records. He was hoping to replicate the success that Dexter Gordon had recently enjoyed. To help him write his Columbia Records debut, Bobby Hutcherson and his keyboardist George Cable began work. It was Bobby Hutcherson that came up with the concept of Highway One, which he named after the Pacific Coast Highway that winds its way around the Californian coast. This beautiful coastal road provided the inspiration for Highway Road. However, as Bobby Hutcherson knew, Highway One meant different things to different people. For those travelling from Mexico and South America, it was the road they travelled through on their way to their other parts of the America. As a result, Highway One is representative of everyone who has travelled that road over the years. Highway One which was one of two tracks penned by Bobby Hutcherson, tries to paint pictures of a journey along that famous coastal road. Having written Highway One, Bobby Hutcherson also wrote Bouquet. His keyboardist George Cables wrote Secrets Of Love, Sweet Rita Suite (Part 2-Her Soul) and Circle. George Cables and producer Todd Barkan wrote Secrets of Love (Reprise). These six tracks were recorded in San Francisco. Recording of Highway One took place at Wally Helder Studios, San Francisco, California between the ‘30th’ of May and the ‘23rd’ of June 1978. Accompanying Bobby Hutcherson was an all-star band. The rhythm section featured drummer Eddie Marshall and bassist James Leary. Bobby Hutcherson’s go-to keyboardist, George Cables played piano and electric piano, while Cedar Walton drafted in to play on Bouquet. They were joined by percussionist Kenneth Nash, flautist Hubert Laws and Freddie Hubbard on flugelhorn. When it came to record the closing track Secrets of Love (Reprise), vocalist Jessica Cleaves was brought onboard. This left just strings and horns to be overdubbed and Highway One was completed. The release of Highway One was scheduled for later in 1978. 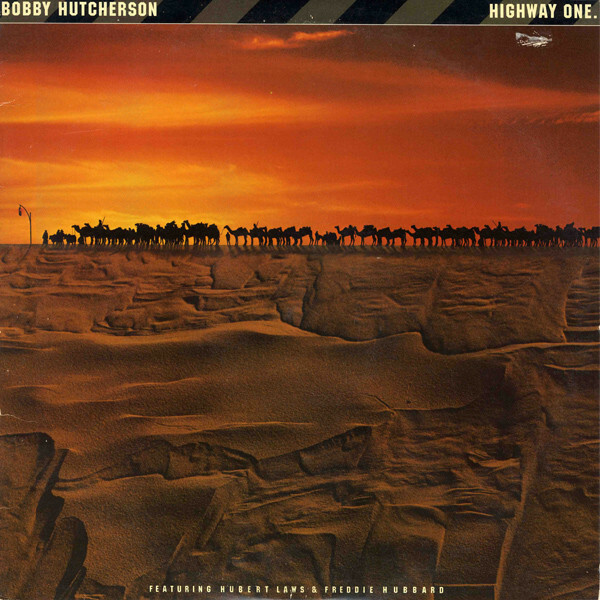 When critics heard Highway One, they were impressed by the first album of Bobby Hutcherson’s post Blue Note Records’ career. It wasn’t just a case of Bobby Hutcherson picking up where he left off at Blue Note Records. He seemed to have been reinvigorated. one of pianist George Cables’ best solos and a vibes masterclass from Bobby Hutcherson. Bookending Highway One was Secrets Of Love (Reprise), which features vocalist Jessica Cleaves. Her thoughtful almost spiritual vocal elevates what’s a very different version to the original version of Secrets Of Love. It seems that Bobby Hutcherson had kept one of the best until last. With Highway One finding favour with critics, this augured well for the release of Highway One later in 1978. Upon Highway One’s released, the album found an audience within the jazz community. However, it didn’t follow in the footsteps of Dexter Gordon’s albums for Columbia, and introduce Bobby Hutcherson’s music to the wider audience it deserved. Despite this, Bobby Hutcherson began work on his second album for Columbia Records, Conception: The Gift Of Love in 1979. Conception: The Gift Of Love. When work began on Conception: The Gift Of Love, Bobby Hutcherson only contributed one of the seven tracks, No Siree Bob. George Cables wrote Dark Side, Light Side and Quiet Fire. The other tracks included Cedar Walton’s Clockwise, James Leary’s Remember To Smile and Hold My Hand and Eddie Marshall’s Dreamin’. These tracks become Conception: The Gift Of Love which was inspired by the new life that Bobby Hutcherson’s wife Rosemary was carrying. Recording of Conception: The Gift Of Love took place at A&R Recording Studios and Rudy Van Gelder Studio, Englewood Cliffs, New Jersey. Bobby Hutcherson was joined by some of the same musicians that featured on Highway One, including the rhythm section of drummer Eddie Marshall, bassist James Leary and George Cables on piano and electric piano. They were joined by percussionists Kenneth Nash and Bill Summers and flautist Hubert Laws. The horn section featured trumpeters Jon Faddis, Danny Moore, Anthony Tooley, Joseph Wilder and Earl Gardner; tenor trombonists Robert Alexander, John Gale and Urbie Green;alto saxophonist Lenny Hambro; tenor saxophonists Daniel Trimboli and Frank Wess; while Romeo Pinque played baritone saxophone and bass clarinet. Cedar Walton took produced Conception: The Gift Of Love, which was released later in 1979. Before that, the critics had their say on what was album number twenty-four for Bobby Hutcherson, Conception: The Gift Of Love. The album was well received by critics, who were won over by an album that took as its starting point hard bop. This was the music that Bobby Hutcherson grown up listening to and he still loved. However, Conception: The Gift Of Love wasn’t a homage to hard bop. Instead, Bobby Hutcherson reworked hard bop and transformed it into music that would appeal to audience in 1979. Just like the twenty-three albums that preceded Conception: The Gift Of Love, it was album that was an album that was guaranteed to swing. That was the case on No Siree Bob, a swinging and irresistible example of hard bop, where Bobby Hutcherson seamlessly flits between 4/4 and 7/4 on the first and second bars of what’s essentiality a twelve bar song. Clockwise is a laid back ballad that features a dizzying solo from Bobby Hutcherson’s vibes. He and George Cables’ piano plays leading roles and vie for supremacy on Clockwise. Joyous and irresistible described Remember To Smile which combines jazz with a samba beat. Then as Dark Side, Light Side is powered along, contrasts abound as Bobby Hutcherson unleashes a another breathtaking vibes solo. He’s accompanied by pianist and George Cables and the horns, who play their part in the sound and success of the track. It’s a similar case on the beautiful, mid-tempo ballad Hold My Hand. However, it’s Bobby Hutcherson that steals the show. Dramatic describes the horn-driven Dreamin’, before the tempo drops and the Bobby Hutcherson and his band ensure the song swings. Closing the album is Quiet Fire, where the tempo rises and the horns power the arrangement along. They leave space for Bobby Hutcherson who unleashes another flawless solo. He’s accompanied by pianist George Cables, and the two stars of Conception: The Gift Of Love ensures the album ends on a high. After Conception: The Gift Of Love had received praise and plaudits from critics, the album was released later in 1979. 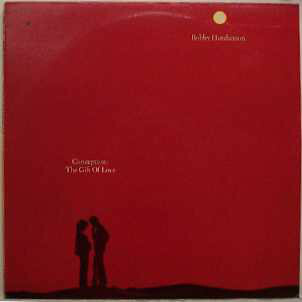 While the album sold well within jazz circles, Conception: The Gift Of Love eluded mainstream record buyers. Still, Bobby Hutcherson was one of jazz music’s best kept secrets, even though he had released twenty-four albums. Soon, work began on the twenty-fifth album of Bobby Hutcherson’s career, Un Poco Loco. Just like his previous album Conception: The Gift Of Love, Bobby Hutcherson only penned one track I Wanna Stand Over There, while George Cables contributed Love Song and Ebony Moonbeams. The other tracks included Jack DeJohnette’s Silver Hollow, Bud Powell’s Un Poco Loco, Red Young’s Ivory Coast and The Sailor’s Song which was written by Steve George, John Lang, Jerry Manfedi and Richard Page. These tracks became Un Poco Loco, which was produced by Dale Oehler. Recording of Un Poco Loco took place at A&M Recording Studios, Los Angeles later in 1979. This time round, the band was quite different to the two albums Bobby Hutcherson had recorded for Columbia. The rhythm section featured drummer and percussionist Peter Erskine, bassist Chuck Domanico, guitarist John Abercrombie and pianist George Cables. They accompanied Bobby Hutcherson who switched between vibes and marimba on Un Poco Loco. It was released in 1980, which marked the start of Bobby Hutcherson’s third decade as a musician. 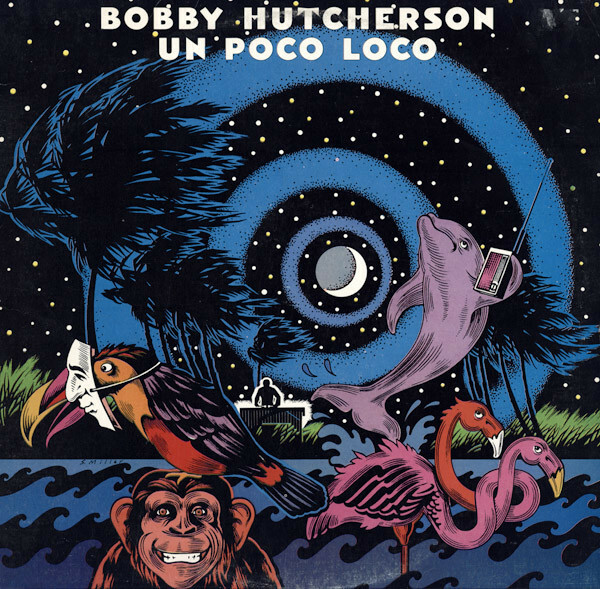 Prior to the release of Un Poco Loco, critics hailed the album as Bobby Hutcherson’s finest since signing to Columbia. Opening Un Poco Loco was a cover of Page’s The Sailor’s Song, which is laid-back and tranquil, as it ebbs and flows. It gives way to the beautiful, dreamy Silver Hollow where guitarist John Abercrombie steals the show with some flawless and fluid playing. Un Poco Loco is a reworking of Bud Powell’s classic, where Bobby Hutcherson and his band bring it up to date. Very different is Love Song, another beautiful track from the pen of George Cables. Again, John Abercrombie’s steel-string guitar plays a leading role as the song reveals in secrets and considerable charms. Ivory Coast then moves in the direction of funk and fusion, as Bobby Hutcherson ensures that his music stays relevant. That is certainly the case, as his band showcase their skills. They continue to do so on Ebony Moonbeams, a seven minute epic, where Bobby Hutcherson and his band seamlessly combine jazz and samba on what’s one of the highlights of Un Poco Loco. Closing the bright and breezy I Wanna Stand Over There ensures the album closes on a high. Bobby Hutcherson had saved his best album until last during his spell at Columbia. Alas, history repeated itself when Un Poco Loco proved popular amongst the jazz community, but failed to find the wider audience that executives at Columbia had hoped. For Bobby Hutcherson, Un Poco Loco marked the end of a two-year spell at Columbia. Between 1978 and 1980, a newly reinvigorated Bobby Hutcherson released a trio of timeless albums which sadly, have never been reissued. This changed recently, when BGO Records remastered and reissued Highway One, Conception: The Gift Of Love and Un Poco Loco as a two CD set. For jazz fans, this was a welcome reissue and one that they had been waiting for, for a long time. At long-last, these three hidden gems from Bobby Hutcherson’s back-catalogue are available for jazz fans and indeed, all music lovers to enjoy. Highway One, Conception: The Gift Of Love and Un Poco Loco are carefully crafted and accomplished albums which feature a much more commercial and contemporary sound. This should have introduced legendary vibes virtuoso Bobby Hutcherson and his music to a much wider audience. Sadly, that wasn’t to be. By the time Bobby Hutcherson left Columbia, the thirty-nine year old had already released twenty-five albums. The first twenty-two albums were released on Blue Note Records between 1963 and 1977. This included some of the best and most important music of his long and illustrious career. 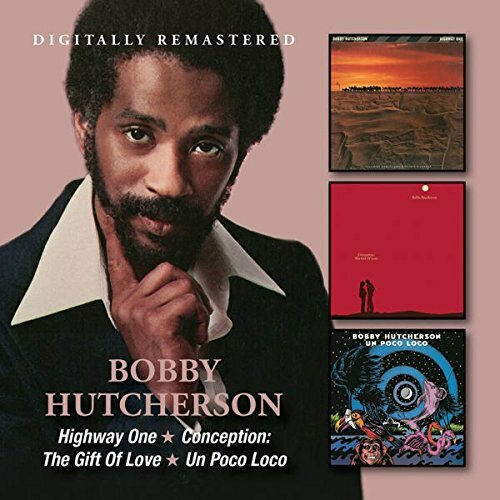 Then between 1978 and 1980, Bobby Hutcherson released Highway One, Conception: The Gift Of Love and Un Poco Loco on Columbia. That took his toll of albums to twenty-five. After that, Bobby Hutcherson continued to record and between 1982 and 2012 released another twenty albums. Sadly, just three years after releasing Somewhere In The Night (Kind of Blue) in 2012, Bobby Hutcherson passed away on August the ’15th’ 2016, aged seventy-five. That day, music lost one of its most talented sons. However, Bobby Hutcherson left behind a rich musical legacy. This includes around forty-five solo albums, and all the albums which feature Bobby Hutcherson as sideman. For newcomers to Bobby Hutcherson’s music, they’ve plenty of choice. The only problem is separating the best from the rest. While Bobby Hutcherson recorded some of his best, and most important, albums at Blue Note Records, the trio of albums he recorded at Columbia Records, are, without doubt, among the most underrated albums of his long and illustrious career. Backed by all-star bands, Highway One, Conception: The Gift Of Love and Un Poco Loco feature vibes virtuoso Bobby Hutcherson at the peak of his powers on this trio oft-overlooked hidden gems. They’re a welcome addition to addition to any music collection. ← TRANSPARENT DAYS: WEST COAST NUGGETS-VINYL.